To support your selection of the right pressure mattress it is worth considering how a healthcare professional would begin to formulate their clinically reasoning to make the same decision. The Braden scale, made up of six subscales, is a measurement of risks that contribute to either higher intensity and duration of pressure or lower tissue tolerance for pressure. The individual scales determine risks based on sensory perception, moisture, activity, mobility, friction and shear. Each item is scored as 1-4 based on a scale of descriptors; the lower the score the greater the risk. As a starting point review the descriptors within the Braden scale to determine which category of risk the user is likely to be in. When purchasing the pressure mattress look for descriptions that stipulate whether the mattress is for ‘at risk’, ‘mild risk’, ‘moderate risk’, ‘high risk’ or ‘very high risk’ as this is making a direct reference to Braden score and therefore the mattresses suitability. If this description is not explicit ensure that you ask. This type of mattress is predominantly for those who may present with some minimal risks of pressure damage. 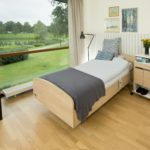 You may be a little less ambulant and skin more likely to be damaged based on age or condition but the mattress itself is providing additional comfort rather than very specialist pressure care. This form of pressure mattress is for users deemed to have a very high risk of developing pressure damage and those with existing superficial pressure damage. Made up of geometrically cut surface cells it is excellent for redistributing pressure whilst maximising comfort and reducing risks of shear and friction. The cells also encourage air flow which reduce risks related to heat and moisture. For the ‘very high risk’ individual and those with existing severe pressure damage, this pressure mattress consists of alternating air filled cells which regularly and automatically alter the parts of the body that bear load, reducing the pressure on any anatomical site. A power unit/pump is usually hooked over the foot end of the bed and controls the alternating action and pressure of the cells. It can be programmed to enable the user and/or their carers’ to adjust the cell pressures based on the user’s comfort and weight distribution. This type of pressure mattress is designed for those who have a ‘very high risk’ of pressure damage or already have a grade 1-4 pressure ulcer. Made up from hundreds of individual triangular cells they are designed to interact directly with one and other to maximise shaping to the bodies form, increasing comfort, further reducing shear and friction and therefore optimising pressure redistribution. The overlay mattress can come in a number of forms including a number of those already discussed. They provide the same level of pressure care as their replacement mattress types but go on top of an existing standard mattress. They may be used if the current bed in-situ is deemed too low and therefore provides additional height and can be an advantage in rural locations where power failure is likely. If a power failure occurs and the overlay mattress deflates, the patient is still well supported on the base mattress. Remember that the overlay mattress increases bed height. For some this may be of benefit but consider the user’s transfer ability and ensure that independence is not inhibited. An alternating mattress cannot be used with a separate profiling backrest other than one integrated into the bed. This is due to straps needing to secure the backrest variator to the mattress and bed which would impact on air flow. Recommend always consulting a healthcare professional before purchasing a pressure mattress to ensure that all aspects of care, indications and contraindications are considered appropriately. Nursing beds: what are they and what do they do?